Last night it had finally fallen silent after the late visitors had left the spa and the the dogs had finally tired of their own barking. I'd fallen asleep, but only for a few hours because the dogs had started up again and kept it going until daybreak. The dogs didn't seem to be barking at each other but possibly at other animals coming into the area. I poked my head out a few times but I couldn't see well from where I was but from within my tent I could hear occasional sounds which suggested maybe monkeys were also in the area. I slept very little most days but I didn't remember having my sleep disrupted so often in one night. After a relatively sleepless night, around 6 o'clock when it was light again I got up and packed everything away. It was in the light of day that I saw exactly where I had set up my tent. It was a great location overlooking the town. Adjoining the spa was what seemed to be some kind of children's park with an elevated theme park like ride which passed just beside the covered walk way. Just on the other side of the fence where I had set up my tent was a large cage which looked like an animal trap. The only thing missing was the trap door which would fall straight down when a largish animal got inside. It could have been for the dogs but I got the feeling it was probably to trap wild boars who probably roamed about the area. The dogs if they were going to be captured could easily be lured by food. Anyway apart from the barking dogs there had been no other animal encounters and Fureai Park Mino had provided me with a place to sleep and I was now ready for another day. The plan was to start at Iyadaniji (#71) and finish at Zentsuji (#75). If I didn't get into a zenkonyado, I would try the shukubo, and if I didn't get into the shukubo there were plenty of hotels where I could probably find a room to stay. Upon exiting the car park area I took an immediate left and was soon approaching the steps that lead up and up and up to Iyadaniji (#71). There were one or two early birds already coming down the steps but it was still very early and there seemed to be very few if any people present. The main hall was at the very top with the daishi hall a little lower down housed in a very different type of building from the usual type of prayer halls I was accustomed to seeing. The daishi hall was part of a much larger construction and had been built around a cave where Kukai is said to have studied and meditated. Shoes needed to be removed before entering and upon entering, to my immediate left was the stamp office, in the center was the altar where I prayed, facing the altar was a wide corridor which led to what looked like a place housing small memorials to people who had passed away and at the very back of the altar was the cave where Kukai had stayed during periods of study and meditation. After going through my usual prayer routine I headed back along the corridor to the space which seemed to house memorials to those who had passed away. I then headed down the side of the altar area to the back where I found a woman reciting sutras. I sat and listened to her and when she had finished I gave her a photograph before she left. I spent about 10 minutes sitting alone and enjoying the calm atmosphere. I then headed to the stamp office to get my stamp and took real delight in the slow and deliberate actions of the man who was doing the stamp. At most temples I had seen the staff place the stamps first and then finish it of with the brush work, this time I watched as he did the calligraphy and then carefully press each of the stamps into place. After he was done with the stamping I asked him to choose a photograph and after carefully looking through them all he was deciding between two he liked so I just let him have them both. Before I left, he gave me a small souvenior which looked like a key holder comprising tiny straw sandals and a small bell. I thanked him and then slowly made my way back down the steps and continued along the trail. It was still overcast and a little cold as I walked along the short mountain trail which passed through a lovely bamboo grove full of early morning birdsong before emerging out near the main road. From there I could once again enjoy the characteristic landscape that was Kagawa. I detoured a little from the marked trail and headed towards a Family Mart a couple of hundred meters away. Inside I got my usual coffee and dorayaki and then headed back outside to enjoy my break. I watched as customers came and went and then quite unexpectedly, a customer exited the store and handed me a bottle of sports drink. I thanked him and told him to wait before he could continue on his way. I pulled out my photographs and after a brief chat he left with two. With my coffee break over, I went back into the store and gave a photograph to each of the staff, just telling them that it was a present for them. I soon arrived near to the next two temples, Mandaraji (#72) and Shusshakaji (#73). The signs for both pointed in opposite directions and the temples themselves were separated by about 1km. 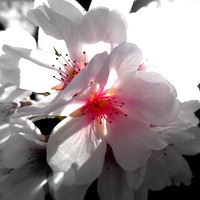 I headed first to Mandaraji (#72) and with the sun out and the cherry blossoms in full bloom it looked really pretty. There was a large group praying at the main hall so I just sat down and prepared my osamefuda, candles and incense and by the time I had done that and taken a few photographs the large group had moved on to the daishi hall. I went through my own prayer rituals at each hall and then just walked about the temple grounds enjoying the cherry blossoms and taking photographs. With the stamp office empty I went in to get my stamp. There was a younger woman and an older woman. The older woman did my stamp and when she had finished, I asked her to choose a photograph. This piqued the interest of the younger woman so asked her to choose one too. With everything done I merrily made my way the short distance to Shusshakaji (#73). it had now turned into really nice warm sunny day and it was just after 10 o'clock. I remembered the large statue of Kukai near the approach to the Shusshakaji (#73) because from the position it stood, it looked like Kukai was surveying and keeping an eye over a wide expanse of land stretching as far as the Seto Inland Sea. Right next to Shusshakaji (#73) was Sakaguchiya Minshuku which not only shared this same panoramic vantage point but also looked like a really great place to stay. Shusshakaji (#73) had a relatively small main hall and daishi hall which stood next to each other. There was a big cherry blossom tree in the middle with benches nearby and a statue of a seated Kukai to one side. Best of all however, had to be the view you got from the temple as you looked back towards the standing Kukai. I set my pack down near the benches by the cherry blossom tree and headed into the stamp office to buy some more osamefuda and some incense. I then returned and sat and prepared everything I would need. I was almost through praying at the main hall when a large group started to assemble around me. I moved onto the daishi hall and had just managed to light my candle and incense when the same group started to move across. I decided to wait for them to finish and while they prayed I walked about taking photographs again. Earlier when I had bought the osamefuda and incense I had got my stamp done too but other pilgrims had entered the stamp office so I didn't have a chance to give the woman a photograph. She was now outside taking a break having handed over her responsibilities to someone else. I walked over and asked her to choose a photograph. I let her take two including one I had taken at Shusshakaji (#73) during the first pilgrimage. She disappeared back inside the stamp office and returned with some money in her hand and said I could buy myself a drink. I told her it wasn't really necessary but she walked over to the vending machine and asked me to choose one. I had just had a drink so I chose the smallest one I could. I took the drink, thanked her and then went and finished my prayers at the daishi hall. It was still not 11 o'clock, I only planned to walk another 5km at most and it was a beautifully sunny day so I sat back down and enjoyed the osettai drink the lady had purchased for me. I then finally got myself ready again, took a few photographs around the large Kukai statue, retraced my steps towards Mandaraji (#72) and then headed on towards ﻿Kōyamaji (#74)﻿. Along the way I came across a rest stop with a series of vending machines, one of them called Potato Boy. Potato Boy dispensed 5 different kinds of potato snack. I put some money in and pressed a button and then sat down to enjoy my potato crisps.﻿ Once I got going again, Kōyamaji (#74)﻿ seemed to turn up much sooner than I had expected. The first thing I did was find a quiet spot to remove my extra layers because it had turned into a really warm sunny day. I again took my time to go through my prayer rituals at both halls and after getting my stamp I just walked about taking photographs. While I was doing this a man approached and asked where I was planning to stay and I told him I hadn't decided yet. The first option was the zenkonyado and failing that I was thinking I would ask about staying in the Zentsuji (#75) shukubo. He headed to the spot where he had left his pack and returned with a business card which turned out to be a for Utangura. I thanked him and told him I was planning to stay there the following day. In fact back at Shusshakaji (#73) I had phoned Utangura and made a reservation for tomorrow. He laughed when I told him that I had lived in Kagawa before and was doing my second pilgrimage. I showed him my photographs and told him to choose one he liked. A little later, as I was leaving, he came over and handed me a small drink and wished me well. It was 12:50 when I left ﻿Kōyamaji (#74) ﻿and having misread the distance to Zentsuji (#75) I imagined I would be there around 2 o'clock but looking at the map as I headed on it looked like I would be there much sooner. In fact I was there just 20 minutes later and about 3 hours earlier than I had told my friend Sanae who I was planning to meet there. Sanae was one of my very good friends and someone I had kept in touch with for the 22 years since first leaving Japan after my first stint. I had met her during my first pilgrimage and we had prayed together at Zentsuji (#75). I had planned to meet her at 4 o'clock but when I took my phone out to message her I discovered I didn't have enough battery to call so I went of in search of a convenience store and eventually found one not too far from Zentsuji Station. Along the way I had also spotted a nice looking hotel called Zentsuji Station Hotel and figured it could also be a possible option for later if the zenkonyado fell through. I found a Mini Mart and got some coffee and something to eat. They had a seating area and after settling myself down I asked one of the staff if I could recharge my phone. She very kindly found an empty socket next to the cash dispenser so I plugged in and got on with enjoying my snacks. A few moments later my phone started vibrating and it turned out be from Sanae telling me she had made some rice balls for me. I was munching on some snacks already, so I thanked her and told her I would eat them later. About 40 minutes later I was back at Zentsuji (#75) again sitting in front of the main hall and on the very same bench I had sat and waited for Sanae the last time. I prepared some things I wanted to give her. I had picked up a small jizo statue from Unpenji (#66) which she would later remind me was almost identical to the one I had given her last time. I also gave her an assortment of other osettai I had received, incense, candles, the straw sandals this morning, a tenugui cloth and a brocaded osamefuda which is supposed to act as a good luck charm. She arrived not long after and since I wanted to wait until around 4:30 before heading to the shukubo to ask about staying in the zenkonyado we ended up sitting on a bench under the shade of a large tree. She was my closest friend during my first spell in Japan and even though I had hardly spoken to her much for the last few years, even after 23 years since I first met her, we seemed to pick up where we had last left of without feeling I had ever left of at all. She seemed more anxious about where I was going to stay than I did but like last time there were plenty of options. I asked her to call the Zentsuji Station Hotel and check the price for me and after calling she said they had a room for 3500 yen which was a perfectly good option if I had nowhere else to stay. We prayed together at each hall and like last time she followed my lead. Just like the last time we had prayed together, this time too, I prayed for her good health and happiness. With prayers done we went to the shukubo to find out about the zenkonyado. The staff took my details and gave me some English worded instructions, a key and some directions. The directions were very simple, go out of the gate and do a few turns. I went out the main gate and took a few turns and realised I had gone the wrong way. The gate was the regular gate right next to the shukubo so a quick backtrack and we were soon at the zenkonyado. The zenkonyado was a large old house and after Sanae stepped inside she said she would find scary to stay in a large old house like this. It was a little old but there was plenty of space downstairs, a kitchen, bathroom, living room and a room to sleep. More than that, it was being provided as osettai so something to be grateful for. I called the owner on an old style turn dial phone but no one answered. After taking a quick look around I walked with Sanae back to her car which she had left in the temple car park. Like the first pilgrimage, meeting Sanae again and praying together at Zentsuji (#75) was something important for me personally. As I watched her drive away it reminded me even more starkly of a life I once had almost 25 years ago. The temple had not been particularly busy and had emptied very quickly after the 5 o'clock closing time. The car park was situated just past the daishi hall and on the way I had seen a stupor like building and one or two other places I had not seen previously. I had not taken many photographs so I walked about and took a few more photographs before heading back to the zenkonyado. I called the owner again and again she seemed to be out but this time I left a short message introducing myself and thanking her for letting me stay. I then laid out a spot where I planned to sleep and while I was updating my notes I heard a voice outside and then large window being slid open. A head popped through and it turned out to be the lady who owned the zenkonyado. She said she had come to feed the cats who lived in her front garden and to meet me too. Her name was Akiko Takemoto and she turned out to be a very interesting character. Takemoto-san had been an English teacher in the prefecture but had been retired for many years. The house which was now used as a zenkonyado had been built by her grandfather and had been the family home until it was turned over to it's present use. She told me she had developed a passion for English after listening to poetry recital by a British writer James Kirkup at a university in Tokyo. That had led her into a 40 year working relationship with him which included help with translating two of his books into Japanese. Her correspondence with James Kirkup she told me was now archived in the Yale University Library. Takemoto-san then told me that she had translated a book about Kukai from the original Japanese into English. The book was title Kukai The Universal and had been written by the highly acclaimed Japanese writer Ryotaro Shiba. I had seen a copy of this book amongst the many that were in the zenkonyado and immediately been drawn to it. Had I not been told by Takemoto-san that she was responsible for the translation it is very likely the fact would have slipped me. Ryotaro Shiba had been honoured with the Imperial Award of the Japan Academy for this work in 1976 so it was definitely a privilege to meet the person who had made it accessible to English speakers. Takemoto-san told me she had written a further two books in English all about about Kagawa. She stayed and talked for over an hour and it would have been nice to have listened to her more but it was getting late. Photographs seemed the only way I could really thank her in any practical way so I told her to choose whichever ones she liked. Before she left she said there was probably hot water for a bath. I had run the tap earlier and found only cold running water and had been planning on a quick cold rub down but discovering there was hot water available was a definite bonus. There was some kind of solar device on the roof of the house which heated and stored water during day and given that it had been a hot day she said there would be plenty of hot water. She ran off some water and sure enough, after a while hot started coming out. I thanked Takemoto-san for everything and after she left, I took a quick bath and then got on with updating my notes and reflecting on my day. My pilgrimage was fast drawing to a close but I was deliberately taking my time through Kagawa. Today like the other two days had been really wonderful. 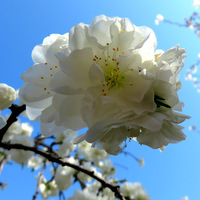 Today the sight of cherry blossoms set against a landscape that was characteristically and unforgettably Kagawa had made for an extra special day. 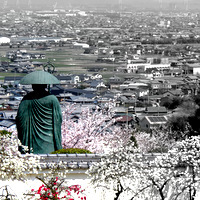 The statue of Kukai surrounded by beautiful cherry blossoms looking out across the a wide swathe of Kagawa towards Marugame was one of many highlights. Meeting my friend Sanae and praying together again at Zentsuji (#75) was for me something undoubtedly special. And finally, finding myself in a wonderful zenkonyado only served to remind me further that there was much to be grateful for.